Does stargazing, fireside cuddling and a private dinner for two sound like a romantic evening to you? Then pop the bubbly and plan a romantic camping vacation with the one you love. Here are a few tips to plan your trip, and three romantic campgrounds to stay at. 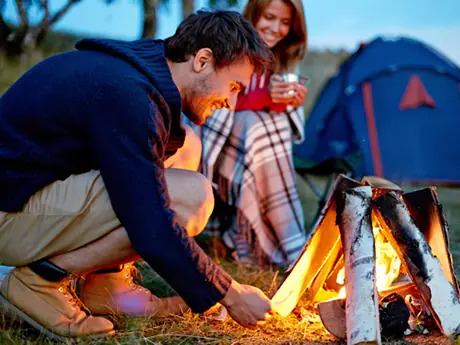 Area: In a remote camping area, you can truly connect with your significant other. Find a small campground that may be less noisy and offer secluded sites. Scenery: Choose a scenic spot, on the water or in the mountains, where romantic sunrises and unobstructed night views are close by. Activities: Activities close to your location make it easy to spend the day exploring instead of hanging around the campsite. Look for campgrounds in state or national parks, that have trails, water access, caves and caverns. Food: With the right tools, it's easy to make your favorite foods camp-friendly. The basic necessities for comfort food at the campsite include: a pot, pan, knife, spatula, tin foil and tongs. Don't forget oil and seasonings too. Sleeping: Turn your two-person tent into a sleeping oasis with an air mattress, two old comforters and pillows.